Ring in the birth of America with this large-batch recipe courtesy of The Patio on Goldfinch’s Brandon Curry. As Bar Supervisor, Brandon personally curates the beverage program, which showcases classic cocktails, along with signature specialties, using house-made syrups and local ingredients. Brandon’s celebratory punch bowl of choice has a tiki twist, with ingredients that are easy to find for everyone! Mix it all together and pour in a punch bowl. Freeze water in a large container (a quart container is best) to make a large ice cube; place the cube in the bowl. This will ensure the punch remains cold with minimal dilution. Serve each cup with ice cubes and an orange twist for garnish if you’re feeling fancy. Fruity, drinkable, and deceptively potent, this is the perfect punch bowl for a large celebration! It’s pretty well known that The Patio family of restaurants loves their pets … and yours too! 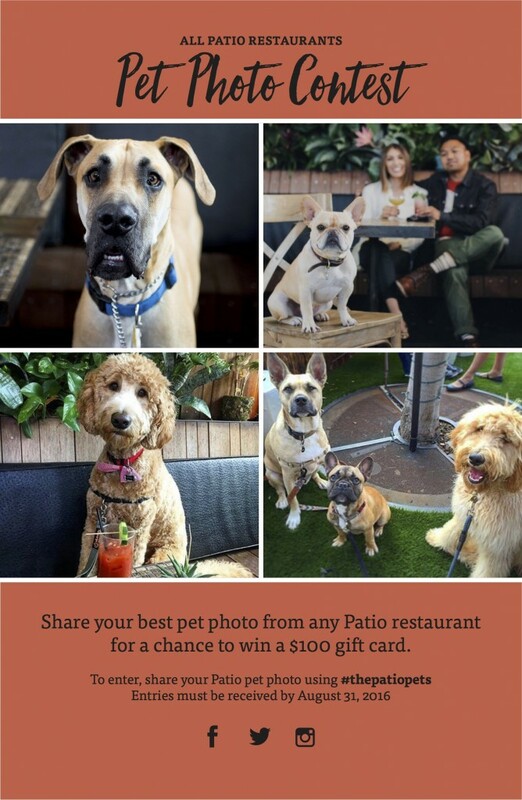 To honor and showcase all the furry family members that join you for dinner, we’re holding a summer Patio Pet Photo Contest. And the rules are simple! Share your photo on Instagram, Facebook or Twitter. Use #thepatiopets and tag the restaurant at which the photo was taken. Share your photo by August 31, 2016. We can’t wait to see your photos! The Patio on Goldfinch is thrilled to be hosting a beer and food pairing dinner that utilizes beer ingredients and fermentation tactics. On Tuesday, August 16 from 6 – 9 p.m., join us for two reception appetizer choices and four courses of deliciously created dishes and the perfect beer pairings. Local San Diego beer company Green Flash and New Belgium beer will be paired with each round of dining. The menu is slated to include tea smoked scallops, salmon crudo and coconut semifreddo with carmelized pineapple and fermented banana. For additional details, stay tuned. To join us, buy your tickets soon. Seats are limited for this creative culinary experience. This will be The Patio’s first foray into brewed food events. We are thrilled to join this food movement and share it with our guests. Tickets are NOW AVAILABLE for purchase at brewedfoodsd.bpt.me! 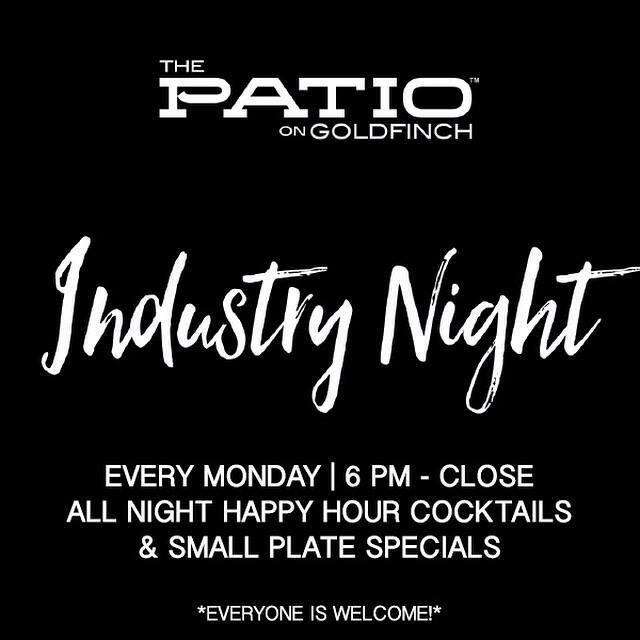 As of July 18, The Patio on Goldfinch is now hosting a weekly Industry Night. We invite all of our industry brothers and sisters to enjoy a creative new cocktail list and tasty small plates–all at delicious happy hour prices. Each Monday, Industry Night guests can enjoy a $5 small plate menu that features some of the restaurants most popular items including: ahi poke tacos, oysters, beef and blue flatbread, and “Chicago style” deviled eggs. Industry Night at The Patio on Goldfinch runs from 6 – 10 p.m. Bar seating only. Industry and non-industry guests welcome. Spread the word and come relax with us! Notice something different? The Patio on Goldfinch recently underwent minor renovations to create a warm and inviting new dining area. 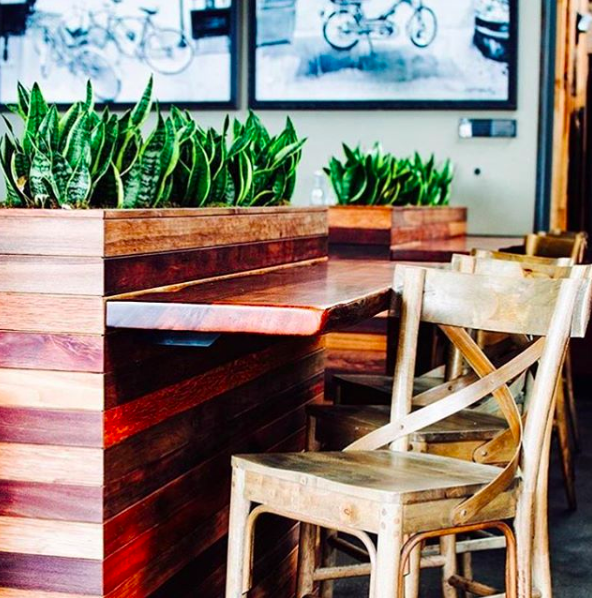 The space, which most noticeably housed our large wooden bar table, was re-imagined with the hopes of creating a more intimate dining experience for guests. Construction within the restaurant lasted only days, but the transformation is already leaving a lasting impact. The premium seating section is more private, fosters better interactions around the table, but enjoys the vibrant atmosphere of the bar. 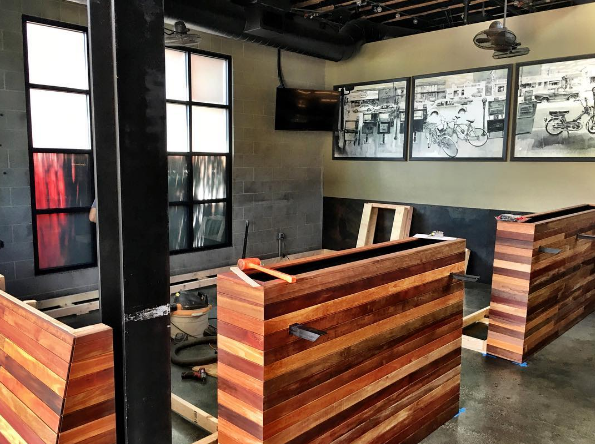 And, not to be overlooked, this new area features sight lines to the bar televisions–just in case you can’t miss the big game. Goldfinch has also added extra bar seating along the outside of the renovated section. Designed by The Playground Agency, the area maintains the elevated, yet casual dining experience Goldfinch customers have come to love. 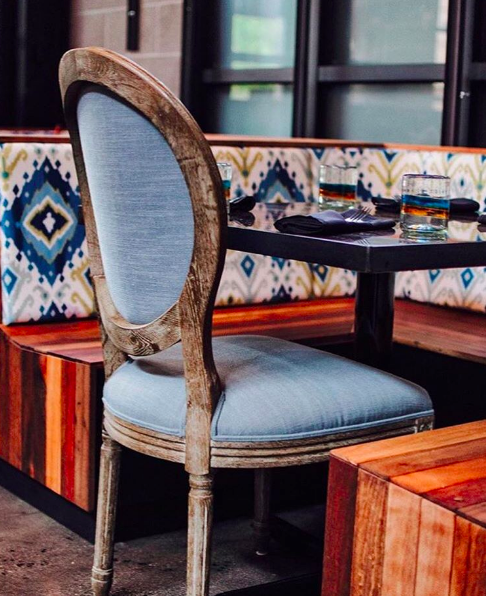 The new booth-style seating is perfect not only for date nights, but small lunch meetings and intimate group dinners, as well. 2015 and come and gone and what a year it’s been! I’ve taken huge leaps in my wine education, changed companies, survived a motorcycle accident and prepared the coming year to be a stellar one, with even more growth, education, sharing and hopefully no accidents to come! This past April, the Culinary Institute of America, Napa Campus, hosted the 1st annual Sommelier Summit. This event is one of a few burgeoning around the country in which wine experts of the highest echelons were invited to share. Sessions on wine list development, wine writing, blind tasting, food pairings and then some, were available to all attendees. It was an incredibly fulfilling experience and one that I hope to experience again soon. Hopefully next time I won’t be in a fluorescent green cast (my accident remember). Not long after returning from my Napa trip I began seriously thinking about my career and how wine was of secondary importance and it needed to become paramount. At that time, I made the decision to leave my company and join the team at The Patio on Goldfinch. This was one of my best decisions of 2015. While I have my hands in many “pots” at the restaurant, nothing stirs my blood like working with our staff and guests on wine education. Product knowledge is the hallmark of every great operation and we constantly strive to ever higher levels of staff engagement and great offerings for our guests. As a part of my continuing wine education, in June, I enrolled in the Wine and Spirits Education Trust Level 4 Diploma Course. This 2 year crucible of wine and spirits education is a knowledge masochist’s dream! For anyone seriously considering increasing their wine knowledge, WSET is a second to none program of study and I highly suggest it. Levels I – III are taught here in San Diego and Level IV is provided by Master Sommelier, Peter Neptune at his wine school in Costa Mesa. www.neptunewine.com All levels as well as Diploma by Peter Neptune, MS.
By virtue of now being part of a relatively elite group of people studying for the WSET Diploma, I was able to apply to become an Associate Judge at the International Wine and Spirits Competition. Founded in 1969, the goal of the competition was to award and recognize excellence in these beverages that we so love to consume. All entries undergo chemical analysis as well as blind tasting by a panel of experts, and me. I have been offered a set of three provisional dates in April (Spanish Wines), May (Italian Wines) and June (Tequila) and will write about these experiences as they happen. For now though I need to figure out how to get to London and back three times next year! Thank god for Air BnB. Billy Nordmeier’s first loves are food and beverage. Having graduated from the Western Culinary Institute in 1999 he’s worked at all levels of food and beverage service and is most happy when sharing his experiences with guests and staff. Billy is a Certified Sommelier with the Court of Master Sommeliers, Certified Specialist of Wine with the Society of Wine Educators, Wine and Spirits Education Trust Advanced and current WSET Diploma student. He has completed levels I and II of the Master Mezcalier Program and has been lucky enough to have judged at the San Diego Home Wine Competition 2015. If he could have only one thing in the world, it would be World Peace… And Guigal’s La La’s (look it up). Cicerone… yes it’s a weird word… yes, it sounds like chicharrón, but I promise you it’s way cooler than crispy pig’s skin. Pronounced sis-uh-rohn, it is “one who conducts visitors and sightseers to museums and explains matters of archaeological, antiquarian, historic or artistic interest,” according to Websters. Except, in this case, instead of museums, I am a guider of the greatest beverage in the history of beverages, beer! The Cicerone® Certification Program was started in 2008 by Ray Daniels, a 20+ year veteran in the beer industry, bringing years of knowledge and expertise to the wonderful world of beer. The Cicerone® program is for beer professionals wanting to take their knowledge base further and being able to guide consumers and staff alike on why we should all respect beer. The Cicerone® program consists of four levels. The first level is Certified Beer Server which consists of a timed, online exam that covers a broad spectrum of beery goodness: anywhere from storing and serving beer properly to properties of different beer styles. Over 60,000 people from all over the world have passed this exam. Every level progressively gets more intensive and more difficult. Certified Cicerone® is level 2, of which just over 2100 people have passed in the US, Canada and the UK. Next up is the newest level, Advanced Cicerone™, with the first exams being held in early 2016 in Chicago, San Francisco, and Washington D.C. Finally, Master Cicerone® wraps it up with just eleven people holding this esteemed title. Ray Daniels and the Cicerone® program filled a void in the wonderful world of beer and brought legitimacy to the burgeoning beer industry. They have created a platform to showcase the dynamic business of beer and the creativity that brewers have been brewing, especially over the past 10-15 years. My role as Certified Cicerone® for The Patio Group has allowed me to take the passion I have for the beverage and the industry and share it with anyone and everyone that will listen. I look forward to starting on this journey with you! What better way than to start on National Cheese Day? On January 20th, The Patio on Goldfinch and The Patio on Lamont will be celebrating the beauty of cheese and beer with a special pairing. Coincidentally, National Cheese Day falls during San Diego Restaurant Week, so come down and make a day of it!